Admiral Suites Bangkok by Compass Hospitality is a four star hotel on Sukhumvit Soi 22, located within walking distance of Asoke BTS station. 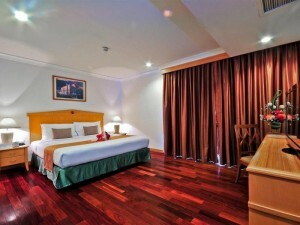 The hotel is conveniently located close to many of the beer bars and nightclubs on Sukhumvit Soi 22. Rooms are extremely spacious and very clean but the hotel feels somewhat dated. An outdoor swimming pool offers good views of the area. One of the best value options for people that don’t need brand new furniture and prefer larger rooms. Guest Friendly: Guests can join free of charge, but may need to leave their ID card at the reception.